Isn't she adorable ?! As soon as I completed the main pattern by Endrucks, I couldn't wait to tat her. Some figuring out was required to tat her in one pass, since in the main pattern, she spans both rows partially. I am sharing a few process pics that I thought might help. 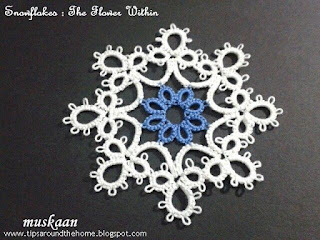 The complete pattern can be downloaded here. 1. 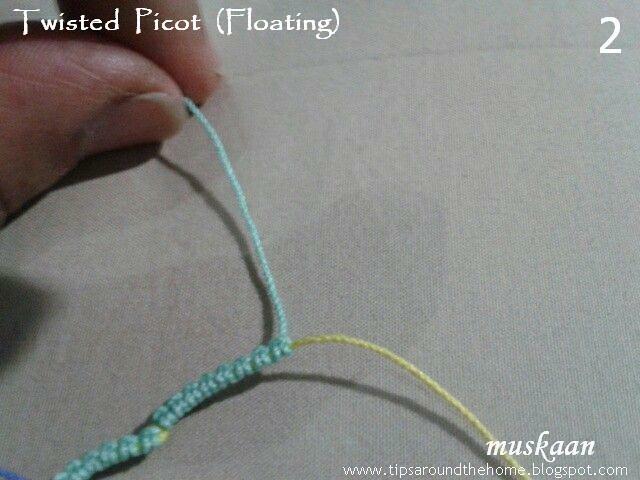 After step #12, make a very small picot & turn back up to continue step #13. This is how it looks so far. Rings A,B, & C are split rings. Rings D & E are thrown/floating rings. I used CWJs in places where the chain edge was contiguous. However these can be substituted with Lock Joins throughout. 2. 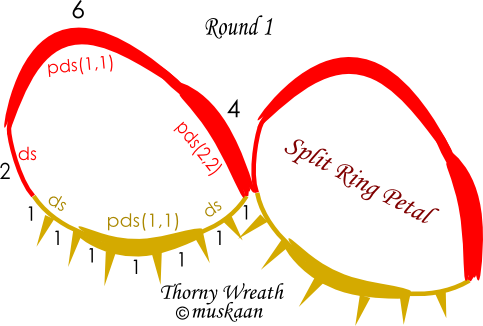 1st of 6 pearl beads in shuttle 1 is brought forward after closing ring F. The concentric chain block to the right has fewer ds as compared to the left one since this curves inwards & one is tatting from the outside to the inner chain. However, I was still not able to eliminate the angularity. Any thoughts ? 3. 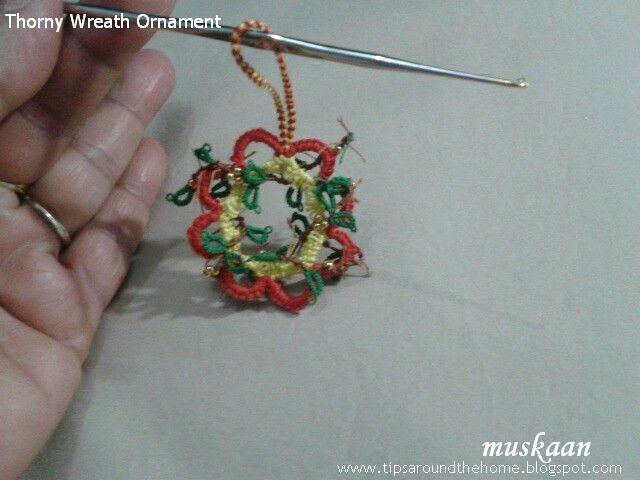 Here, we have reached step #21 with a long beaded picot holding 18 beads & a chain or 9+9 below. The tatting in upside down wrt angel. Hold the 18 beads a bit loosely on the long picot, so that when joined, there is enough slack for a nice curve. 4. This is the complete diagram. Diagram is for the main version only. 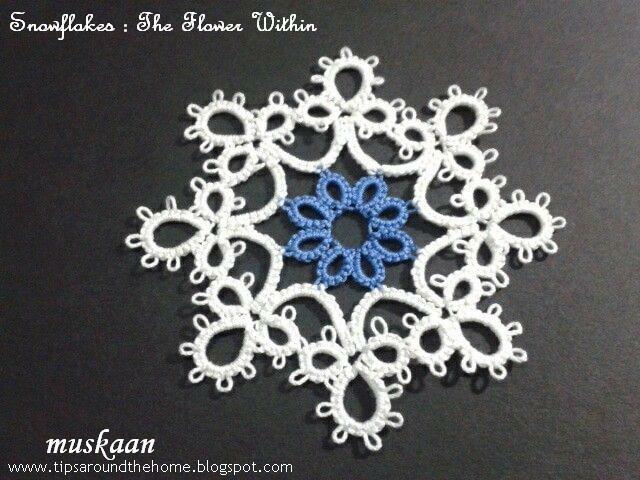 Version 2 has only a few changes, which are detailed in written pattern . 5. Main version of Eleonore's Li'l Angel done in size 40. 6A. Even as I tatted, I wondered if the halo could be made 3D, going all round the head. Above is the first solution I came up with - hold the beads in 2 long picots & then join them together in a single join, at the other side. 6B. This is how it looked in comparison with the original. The halo goes nicely over the head ! Note: I only tatted part of the wing & head as trial. 7. Version 2. In this, I had to preload Shuttle 2 with the gold beads (unlike the previous trial in 6A,B where loose beads were used). 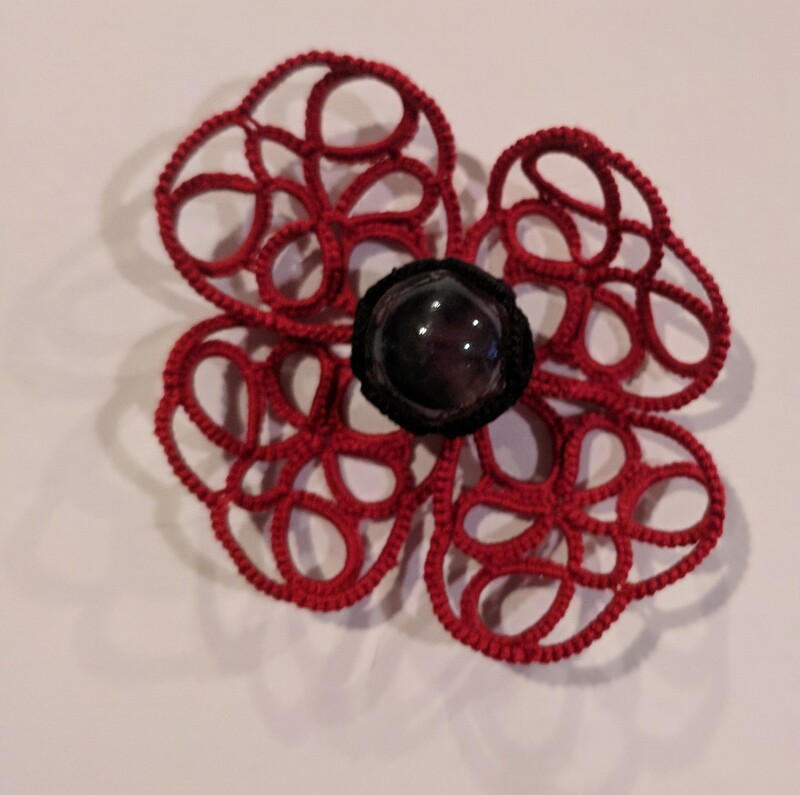 The beads were brought forward in a picot-like fashion & tatting continued. On reaching the other (right) side, a normal join to this beaded ring was all that was required. 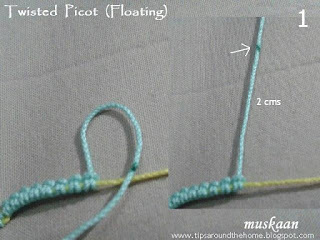 TIP : After the beaded 'picot' I made 1ds, then ring for head. However, this causes the halo to sit low down on the head. 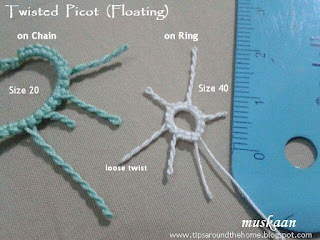 Instead, make 2ds or 3 ds between the gold beads picot & the head ring. Make the same adjustment while joining on other side. It will have an added advantage : the complete halo will be visible ! 8. Trying to show the complete halo in Version 2. I added graduated picots to the wings in this version. Makes the wings a bit more interesting, I think. The Li'l Angels measure just over 2"x2" in size 40 thread. 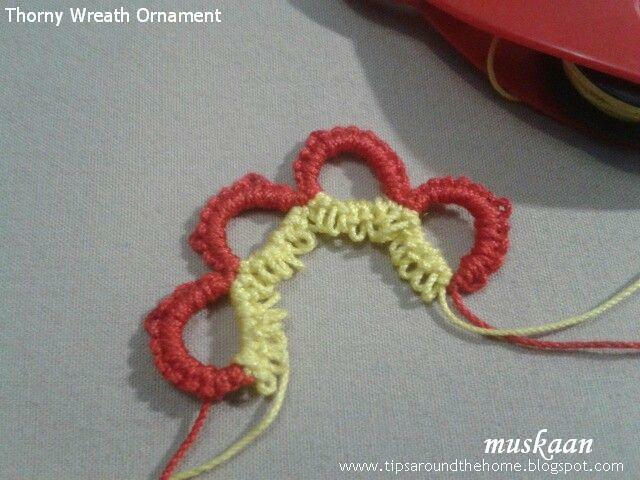 For this pattern, I’m trying something a wee bit different. 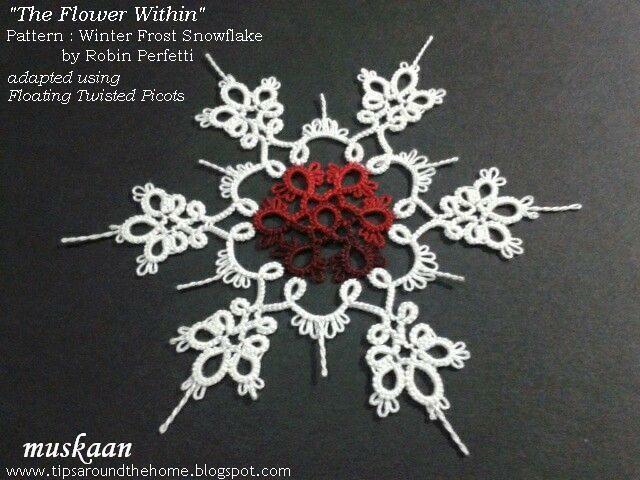 I will upload a proper pdf in my Patterns page after a few days. And being a simple pattern, I have put it all in a one-page layout inspired by the style of some designers. This gives me an opportunity to proofread & correct any late changes to pdf (which I always seem to need), while still being available to anybody who wishes to give it a tat. Center ring is a self closing mock ring (SCMR) with twisted picots alternating with very small picots. Climb out with a mock picot, the same size as the previous vsps. One can avoid SCMR & make a normal ring instead. But in that case, load all 6 gold then 18 silver beads on to shuttle 1. Tutorial for Twisted Picots here. No RW, but SS where required. Tatted in one pass in clockwise direction. Twisted picots in 2nd round chains are of different lengths for a bursting-out effect. Following Frivolé’s recent tip to capture the sparkle as well as the gold & silver beads. 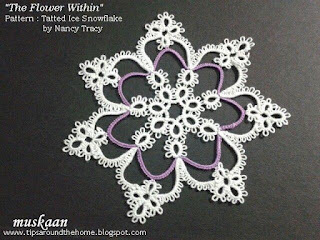 Tatted in size 40 thread, the finished snowflake measures 2" from picot tip to tip & 1" from ring tip to tip. As one progresses, the long picots do tend to come in the way, making it a bit fiddly to handle. Some stiffening will be required obviously . This is not stiffened yet. And what if I stiffened it in this whirled fashion ?! It reminds me of the spinning wheel firecracker, or a cosmic phenomenon . It could be used as a symbolic motif for Diwali, with the use of multicoloured beads ! Many thanks to Robin for her Excellent Inkscape tutorials ! This was drawn after reading & applying part 1 (11a) of her latest in the series here. I think the diagram has emerged much better than all my earlier drawings, right ? I have been exploring a teeny tiny bit, but still a lot to learn from the Master. Play out your own variations & hope you share a pic or link & any feedback . 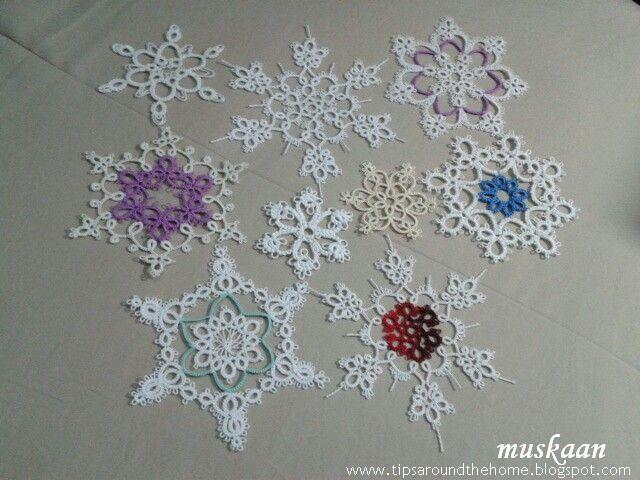 In case it is not possible to print out the pattern, feel free to leave a comment & I will convert to a pdf download. Snowflakes are beautiful. 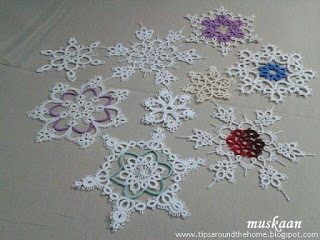 Tatting patterns of snowflakes are beautiful & enticing. Hidden within these cool snowflakes can be a spring flower to warm the heart ! This is my attempt to keep spring alive during the cold winter months. I try to avoid using SLTs. But that creates a problem if one wants to customize the placement of colours. After 1st round (the picots are not even enough, hence the swirl), I planned on using 3 shuttles with some encapsulation to hide the unwanted colour. Doable. But the mood left me – perhaps another time. I ended up continuing a 2nd round with only the aqua blue chains, adding a tiny picot at tip for joining. T&C. Remember my test tat here, with the twisted picots ? I just Had to make a 2-colour version. A breeze to tat up ! And the picots give such a lacy flurry look. Tatted & posted last year, here, but have not been happy with the pic. Love the pattern ! An old motif. Made quite a few just coz I liked the pattern ages back. Haven’t used them anywhere yet. Want to make another in #40 thread this time. 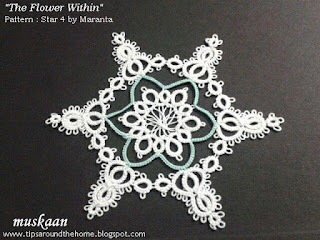 I can see the difference in my tatting of 15 years back & now …Anybody know the source ? Please let me know so that I can give due credit. 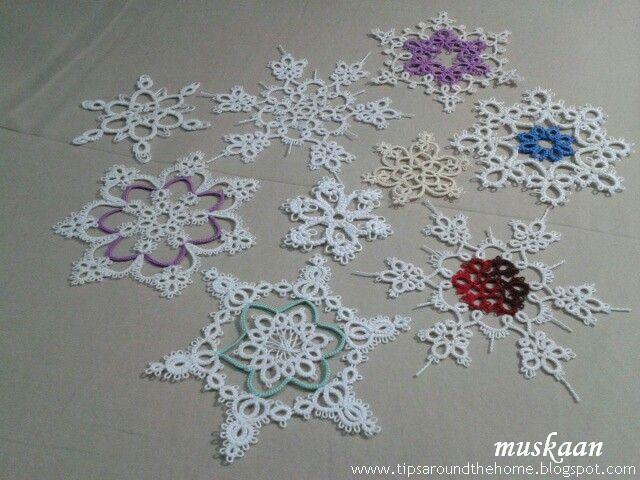 I enjoyed tatting all these snowflakes – relaxing, with a touch of colour for added excitement. 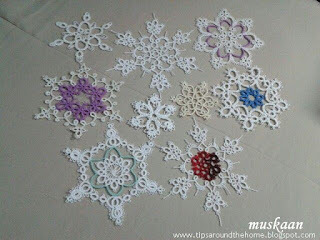 I’ve been tatting many more snowflakes – hope I don’t forget to post. Related Post update : Day 2 Snowflake as part of the flower within series. Any long picot can be twisted while one is joining a new element to it. There are tutorials/videos showing how this can be done. It gives a flat but twisted picot & is used with beautiful effect in 2D tatting. But just as we have floating (thrown) rings & floating chains in tatting, we can have twisted picots that are free-standing or floating too ; unanchored at the tip. 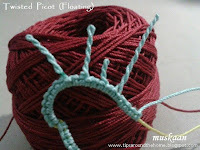 The twist itself keeps the picot taut & free-standing. Following is a series of pics showing how to achieve it, & a few possible variations are included at end. 1. 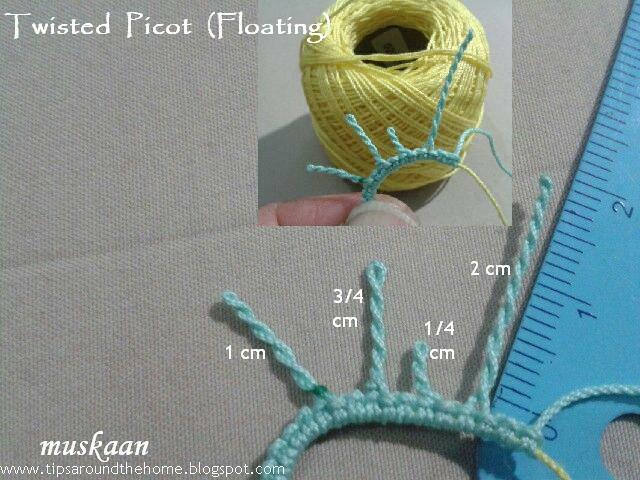 Decide on the length of picot required. For purposes of this pictorial, I am making a 1cm long picot (when finished) & have put a mark at 2cms as an indicator. 2. Pinch thread at the mark in order to start twisting. This is how the thread will look before any twisting. 3. 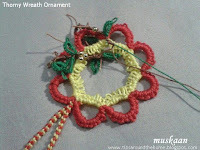 Twist along the 'grain' of the thread, otherwise the thread will unravel ! 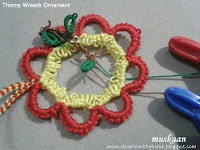 Please note (Feb 6) : Do Not lose your hold on the thread while twisting. If the pinch is slackened while twisting, the picot will not get a firm and dense fold. Moreover, the twisting will spread to the rest of the rest length. 5. When sufficient tension is achieved, ‘fold’ back. Hook shows the midpoint at which we want the picot to fold back. One can use the hook to guide the fold, till one becomes proficient. Magically, the thread twists around itself ! And holds it’s shape !! Please note ... If the thread has enough twists, it will WANT to fold back ! All one needs is a tiny guiding finger/thumb to nudge it to fold at the precise point. 6. Now continue tatting. 1st half stitch being made. Notice the mark. 7. 2nd half stitch made (1ds complete). 3 ds made after twisted picot. 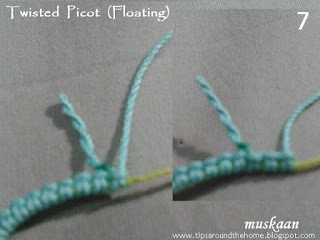 One can smoothen the picot (evenly spacing the twists) by gently caressing between fingers. 8. Showing floating twisted picots on a chain, in different sizes. 9. Floating twisted picots can be made on rings as well. Notice the difference in twists in the ring picots (white) above? Remember this snowflake I test-tatted for Robin ? 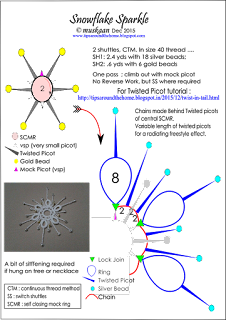 It has floating twisted picots on both chains, as well as rings. 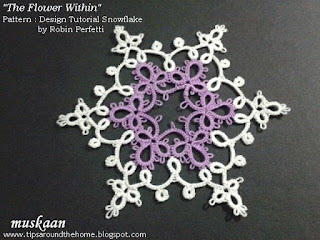 This is a new snowflake pattern I tried today, showcasing another variation. Patty Dowden, in a Round Robin here, first used Josephine ring at end of twisted picot ! Inspired by that, I also attempted a bead at the end. 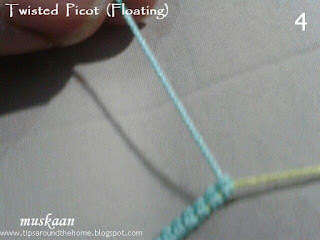 Bead : Place bead at distance required; twist & fold to make twisted picot with bead at tip. Josephine Ring : Using SH2, tat a JR at distance required. 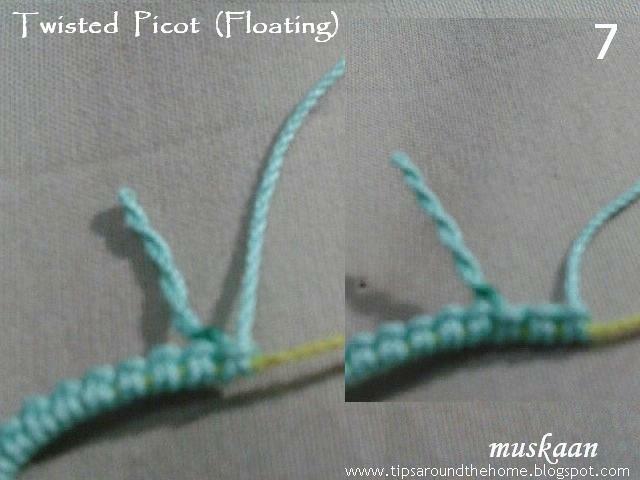 Then twist to make the picot with JR at tip. 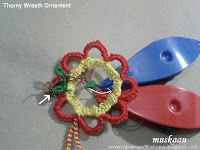 Add few more beads or other elements (with bare thread spaces between) & twist. These embellishments will appear to branch out ! 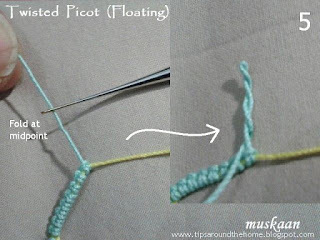 Mary Maynard experiments shared here with twisting long picots. In 1st instance, she joins the twisted picot like a double picot a few ds away. In 2nd instance, she joins the long twisted picot back at same point before continuing with pattern, thus getting 4 threads in the twist !!! 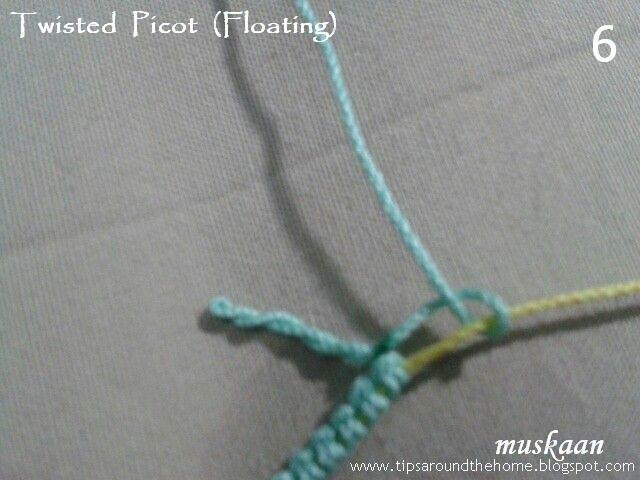 One may need to suspend the shuttle after making twisted picots, to bring the thread back to normalcy. Repeated twisting of same length of thread may cause it to become fragile & fray or break. Hence it is best to practice. 6 ply threads are perhaps better threads to use. 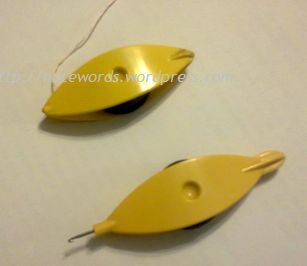 Do Not slacken your pinch at any time while twisting, Until it is ready to be folded. When adding elements like bead or JR at tip, make sure both lengths of picot thread are equal for precise positioning of the added element. 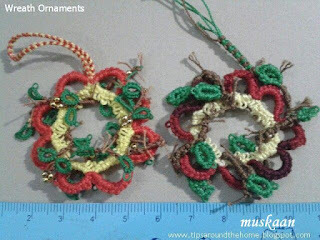 UPDATE : Usha Shah has uploaded 2 videos - twisted picot (with & without bead) , and twisted picot with knotted bead. I think my previous post did not reach some who follow by email. Here is the link to the Thorny Wreath pattern post. It’s that time of the year, & there has been some activity on this pattern for a few weeks now. I wasn’t too happy with colours & working when I first made it. So, it was time to rework the pattern, as well as create a proper pdf, with diagram, to download. 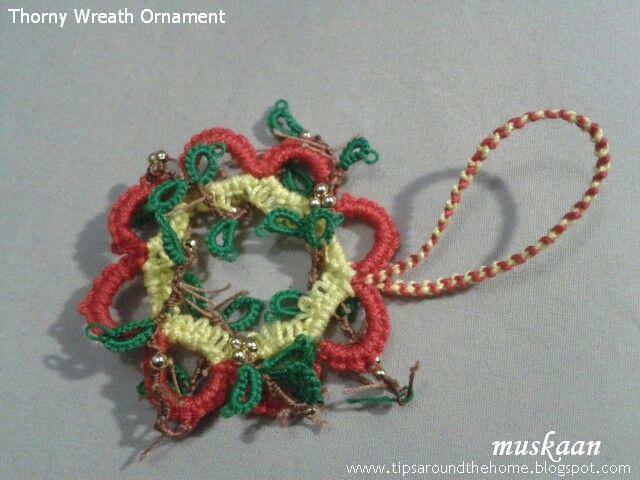 This time I used more Christmasy colours & added a sprinkling of beads. Being fairly small at 4½ cms diameter, it can be used as a tree ornament, a decoration/adornment for gifts, sewn on to a headband, or be used as a pendant, a brooch, or earrings ; embellishments & colours can be customized. This is a 2-round tiny motif where the base 1st round, made of split rings, forms a large flower, and the 2nd round is freeform, interweaving a chain through the center of the flower medallion. 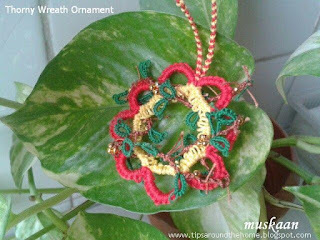 The freeform weaving lends a 3D interlaced effect to the 2D flower wreath & makes each ornament unique. 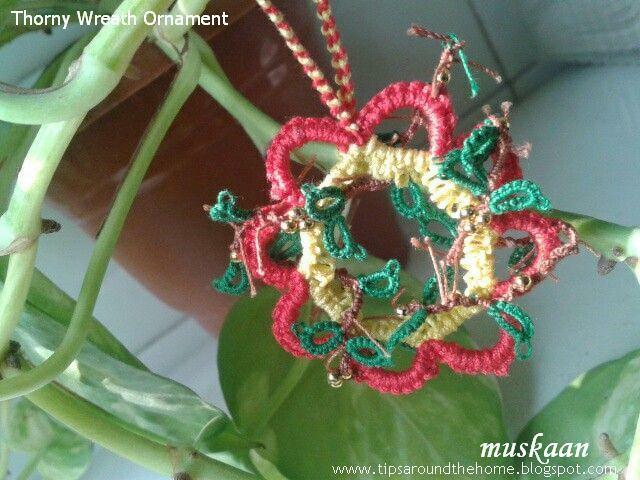 Round 1 is made of 8 split rings, in 2 colours, size 20 thread, and uses padded double stitch, ending in a Lock Chain loop for hanging. 8 SRs are needed to get a central space large enough for normal shuttles to pass through when interlacing Rnd 2. 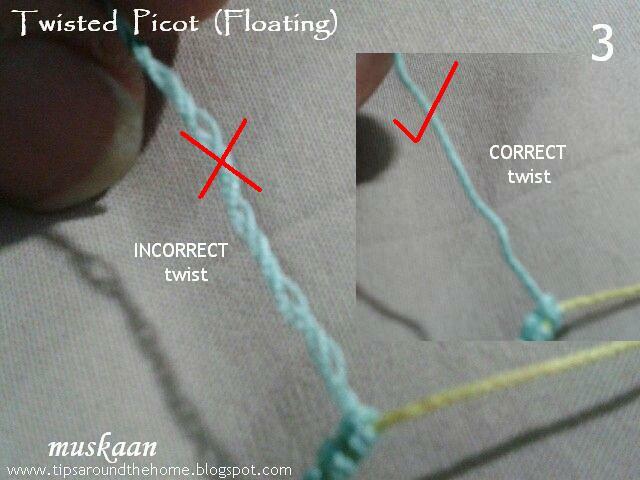 TIP : Padding the stitch (pds) can cause some twisting of thread. Suspend shuttle to remove twists. 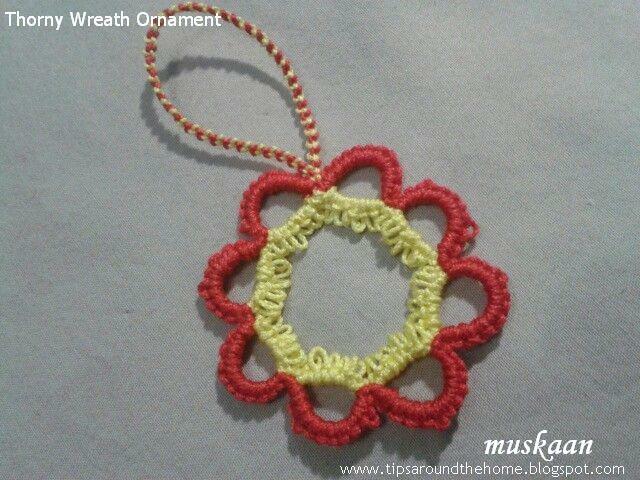 VARIATIONS : Only 6 petals make a beautiful flower medallion with a flurry yellow in centre & red petals around. 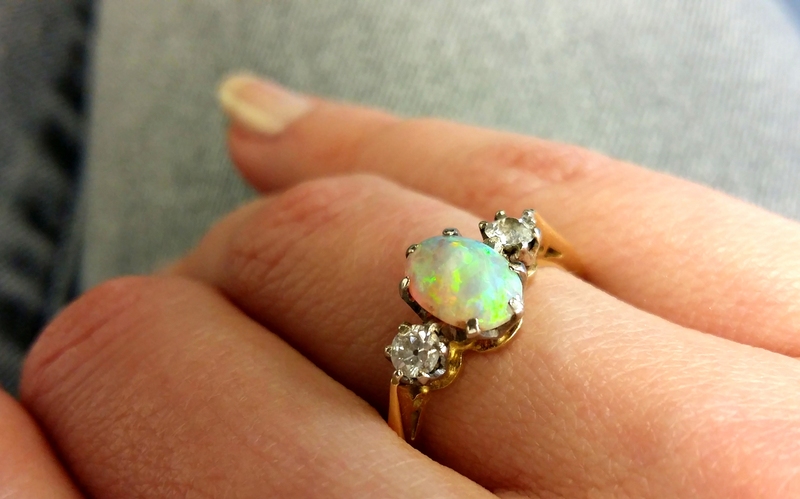 Add large cabochon, pearl or gemstone for jewellery piece. Unlike the earlier attempt, this time I used size 40 thread for the freeform round. Beads were also added to represent berries. Load more beads in both shuttles than strictly required so that one has plenty to play around with. 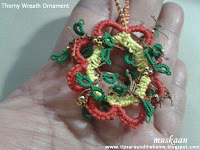 Bring forth beads, tat folded rings leaves, & add the thorns using scrap thread. Instead of making long picots & snipping them, this time I used my spot addition of Corina's fringe. TIP : The thorns can be frayed for a different look. 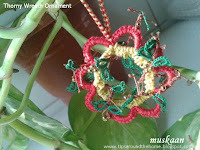 One can use just the freeform vine pattern for a bracelet in customized colours/embellishments. ! It is, after all, the freeform that makes each piece unique & exclusive. No two will be the same ! Corina's Fringe This can be used if one is not using beads . 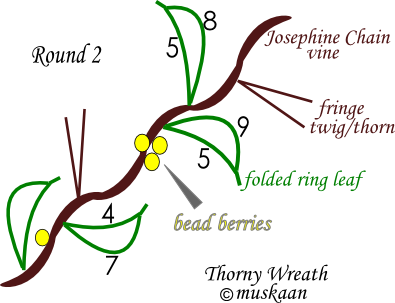 Instead of beads, preload the fringe thorns.